We began our Valentine theme today. We will be having our card exchange next Thursday on the 12th, so today we began preparing for all those lovely cards. I have the children make Valentine Bags. We used to sew Valentine envelopes, but the goodies were getting to big for them so we started to use the bags. Each child gets one white bag. I then have sentence strips for them to write their names on. I actually have three levels of name writers right now: some can write it on their own, some are tracing dots, and some are still tracing over a written name. I asked the children how they wanted to write their name. We put the names on the strips then glued them to the top of the bag. I had the table covered in many different sizes and colors of hearts. I let the children decorate their bags with as many or as few hearts as they preferred. As the cards come in, the children will be delivering the cards to their friends bags--matching names. 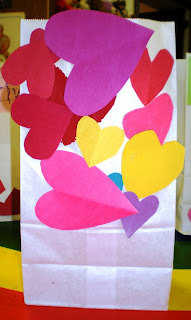 I always enjoy doing this activity as the Valentine bags really brighten up the room. Very colorful! I'm sure they are very proud of their Valentine bags! I'm glad that I looked at this post, because you just reminded me that I'm supposed to turn in a shoebox for Pre-school tomorrow! Thanks for keeping me organized- I need all the help I can get.